Updated: 5:22 p.m. | Posted: 1:12 p.m.
State officials Wednesday unveiled an expensive plan for fixing the troubled computer system for vehicle licensing and registration. They say lawmakers would need to approve another $43 million early in the 2018 session to get the system back on track this year. One Republican lawmaker called the request "mind boggling." The Minnesota Licensing and Registration System, or MNLARS, has been plagued by technical problems since its launch last summer. The cost of the statewide computer system, used for tab purchases, title transfers and other transactions, has already topped $93 million over eight years. 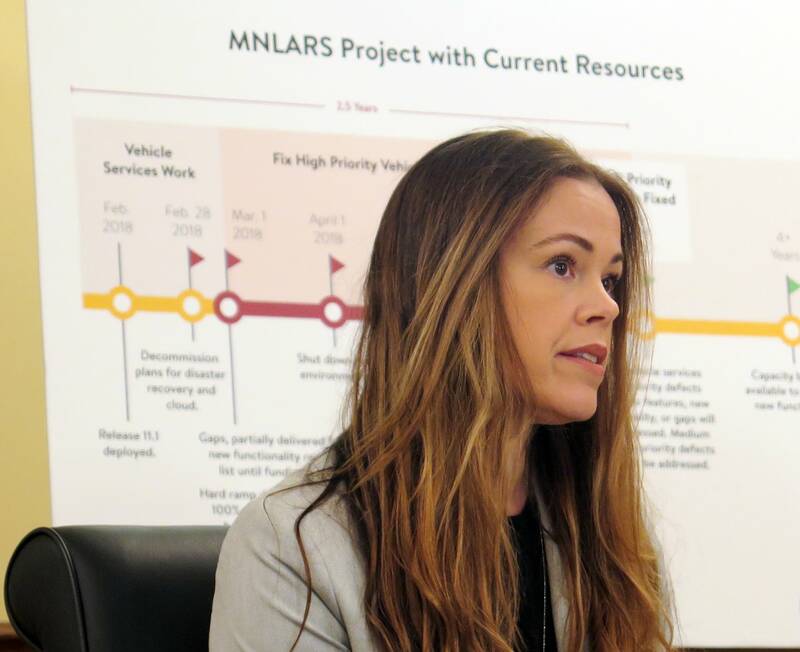 Dana Bailey, executive director of projects and initiatives at Minnesota IT Services, said her agency can repair "high-priority defects" in the system by the end of July if there is adequate funding. The proposal includes $37 million for system fixes and $6 million to upgrade customer service capacity at the Department of Public Safety. Bailey said the request is big but necessary. "The private sector is not constrained by arbitrary deadlines and has the opportunity to test new concepts before launching major projects," said Bailey. "Unfortunately, the state was not afforded either of those options while implementing this large-scale IT roll out. I make this point not as an excuse but as a reality that adds to the complexity of this project." Without additional funding soon, Bailey warned the agency would have to begin ramping down some of the repair work currently underway on MNLARS. She stressed that separate efforts underway to begin issuing REAL ID-compliant drivers licenses would not be in jeopardy. DFL Gov. Mark Dayton is supporting the funding proposal and urged legislators to do the same, but Republicans Wednesday seemed resistant. Bailey acknowledged it will be a tough sell to legislators. She said the initial allocation could be smaller than the full funding request. "This is above and beyond anything I could have possibly imagined," said. Rep. Paul Torkelson, R-Hanska, the chair of the House transportation committee, has grown increasingly frustrated by MNLARS. Calling the $43 million figure "mind-boggling," Torkelson said he's not ready to make any commitments for additional funding. "We've been told that this system was going to work before rollout. It didn't work. When it didn't work the administration denied that there was really any problem," Torkelson said. "Now, all of a sudden, they are demanding this $43 million and virtually holding a gun to our head, saying 'if you don't give us the money we're going to shut down functionality of the system.' It's really untenable." The Senate transportation chair, Scott Newman, R-Hutchinson, said earlier this month that any additional funds should be contingent on people losing their jobs. Asked about the need for accountability, Dana Bailey said she didn't have an answer to that. But she said bringing in all new people would only add to the problems. "You let people go that have been working on the system, that know the system, that know what the system needs, in order to fix it, and you start all over," she said.